Ready for some more Summer shades? OPI have released a set of six full-sized (yes, full sized!) 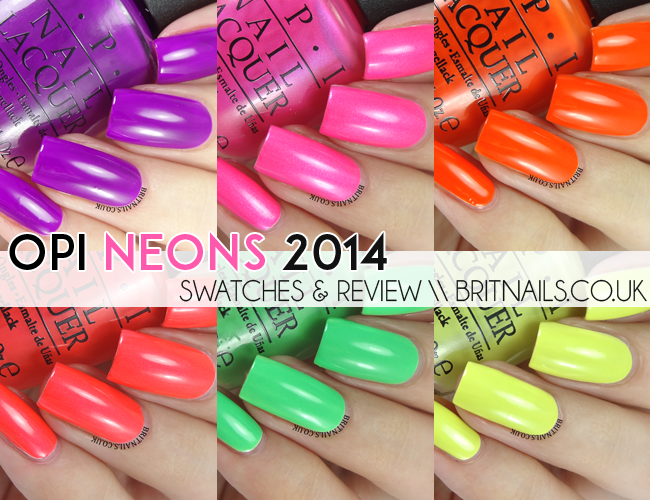 neons for Summer 2014, and I have them all to show you today! Released alongside these polishes is the new Put A Coat On! Natural Nail Base Coat, which is a white polish designed to be used underneath the neons to make them really pop. It's a pretty decent white and is fairly opaque in 2 coats. You could always use a regular white polish instead, but you must make sure you have an even coat of it before you apply the neons! It also has to be completely dry or you risk mixing them together. I've used 2 coats of Put A Coat On! underneath all my swatches, and it really does make a difference to the colour. You can try them without if you prefer, but the colours aren't as bold. All of these shades dry down to a matte finish, so I'd suggest finishing off with some top coat, as I've done. Life Gave Me Lemons is a sour lemon shade, with a hint of green to it. I used 2 coats over Put A Coat On! Hotter Than You Pink is fuchsia with a hint of shimmer, which I wasn't expecting! I used 2 coats over Put A Coat On! Down To The Core-Al is a bright coral, again I'm not sure if I'd call it a neon. 2 coats here over the white base. I'm not overwhelmed by this collection, they're nice enough colours but they just don't feel like neons to me...rather just "brights". The formula also isn't as good as I'd hoped and you definitely do need that white base to help you along. Having said that, there's 1 or 2 shades in here that I'm glad to have. What do you think, are you a neon fan? You can find these now in department stores and salons nationwide, RRP £11.95 each. They're also available in OPI GelColour. Absolutely gorgeous swatches of these! Pink, purple and orange are my favourites. Not much of a neon fan though, so I'm glad they are more 'brights" (well said) than neons. While I like the colors, I also feel they are not as neon as I had hoped. And I cannot understand why you would need a white base to make them neon. Brands like China Glaze make real neon polishes that do not need "undies". So I will probably pass on those, even though I like Life Gave Me Lemons a lot! Awesome swatches! I'm drooling over that orange and the lemon-lime one! I have a weakness for yellow-leaning neon greens. I always use white under neons where possible, but finding a white polish that gets opaque in 1-2 coats is a challenge! 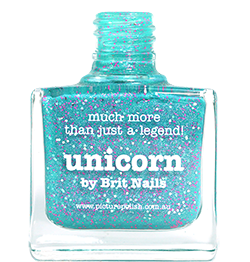 It sounds like the base coat in the collection isn't super opaque, would love to see a swatch of that alone to see how it compares to a traditional white polish. Much love!